A man was knocked down and killed on Monday evening in the Toledo District. Police say Francisco Sis, a resident of San Marcos Village, was crossing the southern highway between miles eighty-seven and eighty-eight sometime after six when he was hit by a pickup truck. 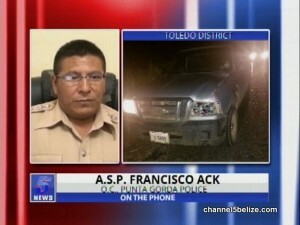 The driver of the vehicle, Gregorio Choc of San Felipe Village in Toledo, has since been detained pending the investigation and served with a Notice of Intended Prosecution. Police in Punta Gorda say that the case file will be forwarded to the D.P.P. for further directives. ASP Francisco Ack says that no urine or blood samples were taken from the driver because their investigation and processing of the scene didn’t show any need. He noted that the stretch of road where the accident happened doesn’t have any street lights.